A couple years ago, my Kobo e-reader died, and I was devastated in a way that is probably unhealthy, considering it was just an amalgam of metal and plastic. I was unable to replace my dear departed device for various reasons (mostly because I was broke), but I still needed to get over my grief. I needed to get back to reading something. The idea of purchasing a book to read on my computer made my head hurt, but the thought of paying more than twenty dollars for a paper version was horrifying. Then I remembered one place where books can be acquired for free: the library. After using this institution only for research materials for so many years, I was delighted at the prospect that I could go to this magical building, check out a book about whatever I wanted, and keep it for two weeks. The Ronald J. Norick Downtown Library. (405/231-8650, mls.lib.ok.us). At 114,130 square feet, the downtown library has the ability to both overwhelm and comfort me. Being surrounded by so many great books, magazines, and archives creates a feeling of limitless possibilities. However, it also leads to hours spent pursuing said possibilities. I guess if I have to spend two hours wandering around anywhere, I would rather do it in the company of my favorite librarians. The Bizzell Library at OU (more specifically, the Great Reading Room). (405/325-4142, libraries.ou.edu) During my four years at college, reading for pleasure was pretty much a daydream. I didn’t have time for it, since I had two articles, a paper, and a news package due in any given week. But this beautiful cathedral to literacy—complete with ornate wooden arches, tall gothic windows, and silent visitors—made required reading feel, if not pleasurable, at least a little more tolerable. The “library” at Oklahoma Today. This may not be a library in the strictest sense of the word—it’s not really open to the public, and it’s funded, in large part, by review copies from publishers—but this collection of books is nonetheless an important part of my life. Although its proximity cannot be overlooked (I can literally scan the titles from my desk), that is only a minor factor in why I love this cozy corner of the office. 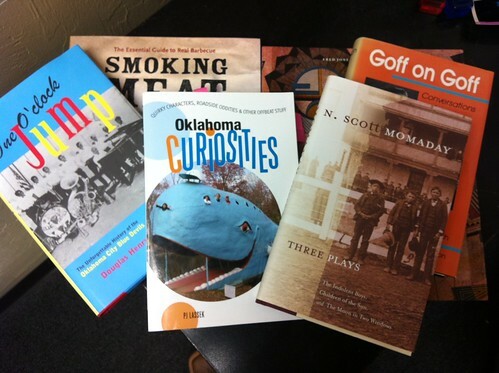 From Pretty Boy by Michael Wallis to Cherokee Women by Theda Perdue, I can learn just about everything about Oklahoma. As someone who would like to one day overcome my title of Oklahoma Today’s “Worst Oklahoman,” this is a place I should visit every chance I get. These places may be as close as I’ll ever get to riding the Chisholm Trail, meeting Benjamin Franklin, or earning an advanced degree in potions, but the two weeks of magic I get between checking out and returning a book isn’t bad.